So as I mentioned before, this Acne Studios Musubi Mini bag was my one purchase for the month back in February and I purchased it secondhand (and for 20% off) at TheRealReal. I’ve been eyeing this bag for over 6 months and I still loved the look, so I decided to go for it. And I have to say, I have zero regrets! I first was influenced to wanting this bag via Eva Chen’s Instagram (darn you Instagram) but when I polled y’all on stories only half of you guys liked it (which also truthfully sways my opinion). I myself was intrigued but wasn’t sure if it was cute or just too much. And I’m so glad I did hold off on impulsively purchasing right then and there because it gave me time to ruminate on it and now I know I really do love it. Also, during those 6 months, I got my favorite Celine soft cube bag (which I still really love but am currently letting it “rest” so I don’t wear it out too soon) and realized I love leather bags that look soft and pillowy. So I was pretty sure when I bought this in February that I would love it. If I had a choice, I might have gone with the tan colored one, but since the black one was what’s available on TheRealReal, black it is! As for the quality of the calf leather of the Acne Studios bag, it’s really gorgeous. Comparing it to the calf leather of my Celine soft cube bag, I would say the grain of the Celine bag is slightly finer but not by much (but the Celine bag also retails for $700 more). 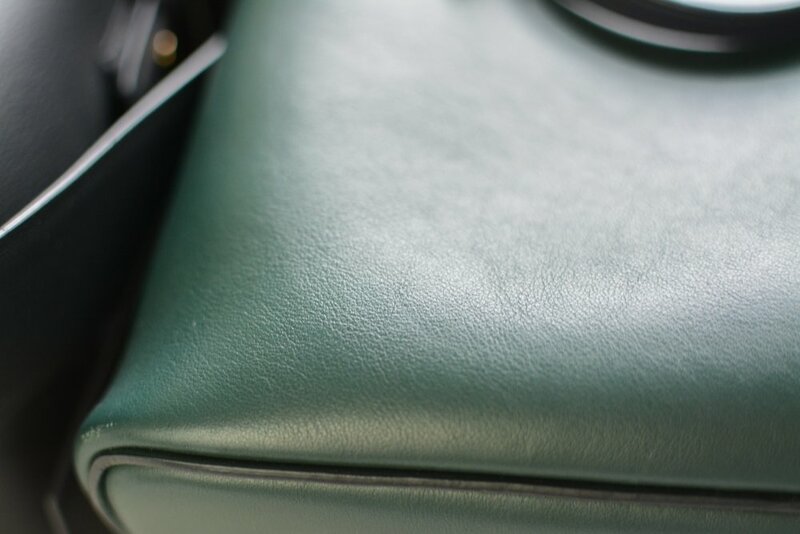 And while the Celine bag is lined with calf leather, the Acne bag is lined with lambskin making the inside buttery soft but also helps keep the bag light (lambskin is lighter than calfskin). Since I’ve been using this bag during the rainy California winters, I first protected it with some Chamberlains Leather Milk No. 3 (reviewed here). It gave the leather a slight sheen, due to the slightly waxy formula that’s meant to repel water, but the bag has held up in downpours with no issues so far. Also the durable calfskin has held up great with zero scratches or nicks. The interior of the bag is divided into 2 sections with a zippered pocket divider. It’s perfect for keeping my things organized with my wallet and phone in one section, my keys in the zippered pocket, and everything else in the other section. The bag closes easily with snap buttons at the top, but I’m also not too worried about the security of the bag when wearing it over my shoulder or crossbody because the thick top handle tends to hide or cover the opening of the bag. Currently all my bags have pretty thin crossbody or shoulder straps so I love the thickness of the Acne Studios strap and top handle. It makes carrying the bag super comfortable. Also the long crossbody strap is adjustable via some pegs on the sides of the bag that’s hidden by the mini knots. Having never tried Acne Studios clothing before, I wasn’t sure what to expect about the quality of these bags. But I have to say I’m quite impressed (and this is coming from a long time bag lover). These made in Italy leather bags are really beautiful and durable. Also the design is different enough so even though it’s a pretty minimal black bag, it’s not plain or boring. Also the word musubi refers to my favorite rice ball snack (and in Hawaii, my favorite spam rice snack) which maybe makes me love the bag even more. But the word also works for the tying of the Obi sash on Japanese kimonos, which is what Acne Studios was referring to. Either way, I love this snack of a bag and can’t wait to get over 100 good wears with it! I rarely regret selling a handbag because usually by the time I’m ready to sell it, the bag has gone unused for quite some time. But of course there’s always an exception to the rule, and for me the exception is the Celine Medium Box Bag. 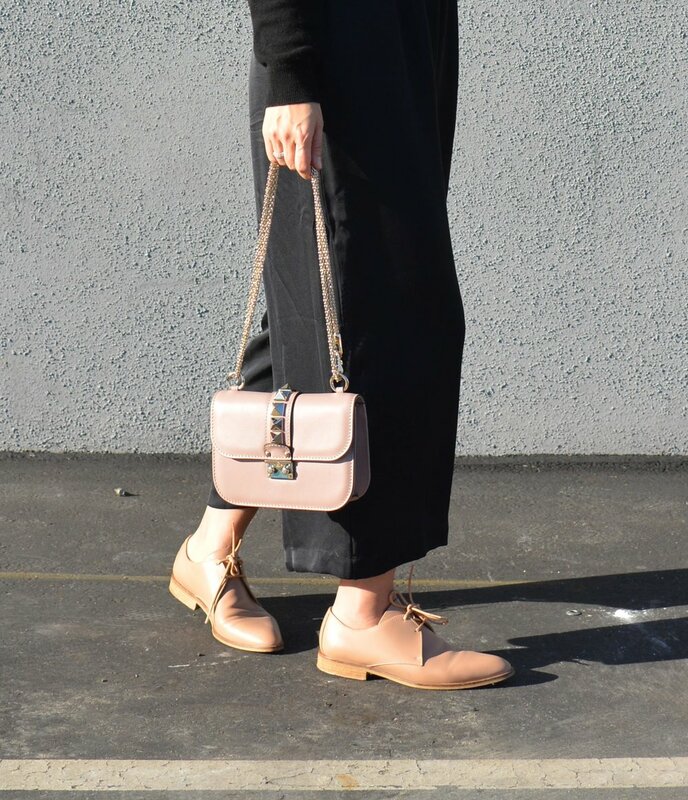 Once in awhile I find myself wistfully thinking “I could really use that bag right now.” I originally purchased the bag back in 2015 through Fashionphile (my favorite consignment site) at a price that is less than what they are selling for now used. Yep, can you believe this bag is just as pricey if not pricier 4 years later?! Talk about holding its value (also I know with the end of the Phoebe Philo era, all great Celine classics are going up in price). The calfskin leather of the box bag was surprisingly durable, even though it was such a light color. I had it for several years and by the time I sold it there were only one or two light scratches. There’s no color transfer and no major gouges, despite my usual roughness with bags. The leather held up beautifully. The clip closure is relatively easy to use (and not as bad as say the closure for the micro belt bag, which was always a pain). The shoulder strap is adjustable and pretty easy to adjust (it was like one of those clip mechanisms you find on belts). The inside is subdivided into three main compartments which made organization easy. One of the compartments was zippered and a tad smaller than the other two. You can’t hold a lot in each compartment since the inside of the bag isn’t as roomy as you would thing. I would be able to hold my wallet in one compartment, my phone and keys in another, and sunglasses and some lip balm in the third. But it could hold the essentials easily enough. So why did I end up selling it? Well first of all the bag is not light. The thick calfskin leather with the all the compartments ends up weighing down the bag even when empty. Also I don’t usually carry boxy bags as my everyday bag. My ideal everyday bag is Celine’s soft cube bag (reviewed here), so I only ended up carrying the box bag on date nights or special occasions. However hindsight is 20/20 and what I really should have done was sell one of my Chanel bags (similarly boxy and only used for special occasions) and kept this one. Ah well, sometimes there’s just a bag that gets away. But if I were to seriously repurchase this (and I still might in a more neutral color because it’s such a classic! ), my go to shop would of course be Fashionphile (their selection of Celine box bags here) or TheRealReal (their selection of box bags here). Do you guys ever have bags or items of clothing you regret selling? What were they? Though my luxury bag obsession has died down a bit in the last couple of years (thanks to being a bit more conscious about my consumption habits and also getting into slow fashion), I’ve still purchased (and sold) a lot of designer bags in my lifetime. So why not share my experience of the 5 worst and 5 best designer bags I’ve ever purchased and used. 1) Goyard St. Louis GM bag: I reviewed the Goyard St. Louis tote here and even in the review I stated all the things I didn't like about it. My main gripe was the fragile and floppy canvas. Also the straps were quite thin and would dig into my shoulder when the tote was filled up (which is something one does with a tote). This tote was only for the brand-name looks. If you’re looking for a cheaper practical workhorse of a tote I recommend Everlane’s Day Market tote or if you’re looking for a more upscale tote but one that’s still practical, I would go with the Celine cabas phantom tote (which is on the “Best” list below). If you absolutely love the Goyard print and have to have one, the PM size might be better since it won’t flop around as much nor can it be weighed down with too much stuff. 2) Loewe Hammock bag (reviewed here): When I got it, I just really loved the unique shape of the bag. But because it doesn't close very securely (which my mom demonstrated to me once by pick-pocketing me without my knowledge), I was hesitant to use it as much. You could clasp the inner hooks together but then it becomes a really awkward shape to carry. The flat handles were also not that comfortable if you were carrying the bag on your arm (and the handles were a bit tight so that if you were wearing a coat, you wouldn’t be able to really carry it in that way). Also, if you aren't careful with how you store it, the leather starts to bend in weird ways. I sold it for about a $200 loss (for about a year of use). 3) Celine Small Trotteur bag (reviewed here): The problem for me is that it was just too small for my needs. If I wanted a small going out bag, I’d reach more for my Chanel, so this Celine didn’t get used much. Plus the metal hardware as a closure isn't as secure as I would like. Looked cute but not super functional in the small size. 5) Gucci WOC (reviewed here): I was following the crowd on this one, getting the newest "IT" bag. The construction was meh and I regretted it pretty much as soon as I got it. I'm glad I sold it fairly quickly so there was still a lot of buzz around the bag, so I didn't lose much money on the purchase. I think that was the last trendy bag I've purchased and I'm glad I'm finally starting to learn to buy bags for their quality and not for their name. 1) Celine soft Cube Bag (reviewed here): This is the bag that I traded my Valentino Glam Lock Bag for and it was the best bag decision I ever made (I did the trade over at Fashionphile, which sometimes has a soft cube bag now and then). I used this Celine soft cube bag so much that it was my number 3 most used item in 2018 (and I only got it in September). This bag has held up like a champ and you know how I abuse my bags (case in point). I can throw all my essentials into this bag and then some. It’s the perfect size between a small bag and a mid-size one. The top handle straps are easy to use when carrying the bag on my arm and the crossbody strap is convenient for carrying the bag over the shoulder but it’s thin enough to not get in the way. 2) Celine Small Cabas Phantom (reviewed here): This bag was also one of my top 20 most worn items of 2018. This is a really well-made high-end leather tote. The leather is soft but not floppy and it can stand on its own base. I like that you have the option of pulling the straps and tying them to make the bag smaller and more secure. The small size is the perfect size without being too big and the bag itself doesn’t weigh a ton. Hands-down my favorite luxury tote ever. You can usually find a great selection of authentic used Celine Cabas Phantoms at my favorite consignment site, Fashionphile here. If you’re looking for a more affordable but similar option, I recommend Cuyana’s Classic Structured Tote. 3) Celine Micro and Nano Belt bag (Micro reviewed here and Nano reviewed here): The Celine belt bag is so nice I bought it thrice, lol. Yep I started with the mini size (the first size to have the crossbody strap—the small size has just the top handle). And when the Micro size came out, I got that one new at the Celine store in Hawaii (that’s the black one in the pics above). As much as I love that size, it still was too big for my everyday needs and ended up weighing a lot more than I wanted to (mostly because I would fill it up, but also because it was just bigger, had more leather to it and thus weighed more). So the following year I upgraded by downsizing to the newest smallest size, the Nano, and I’ve finally found the right belt bag size for me (that was a classic goldilocks story right there lol). As I stated in the review, I love the Nano size because it’s lighter but also because it has a regular clasp for the front (instead of the finnicky hook thing that all the other belt bags have) and the crossbody strap is adjustable. The Nano is harder to find on any consignment site, though Fashionphile usually has a pretty good selection of Micro belt bags here. 4) Fendi By The Way Bag (reviewed here): This is currently the oldest bag in my collection and is probably one of my most practical bags. I love the foldable handles for when I want to carry the bag crossbody and the three compartments on the inside that make finding things super easy. Even though this was never a popular style, I’m never going to give this bag up. And since this was never an It bag, you can find them for really good prices used. 5) Hermes Lindy 30 (reviewed here): This was my “holy grail” bag for a long time even though it’s such an obscure bag (at least for Hermes). I first heard about it through a purseblog or bagsnob post in the height of my bag obsession days. But ever since then I’ve always thought this would be the first Hermes bag I buy. And so two years ago, when I saw a used one at a decent sale price at the Fashionphile I bit the bullet and have no regrets. 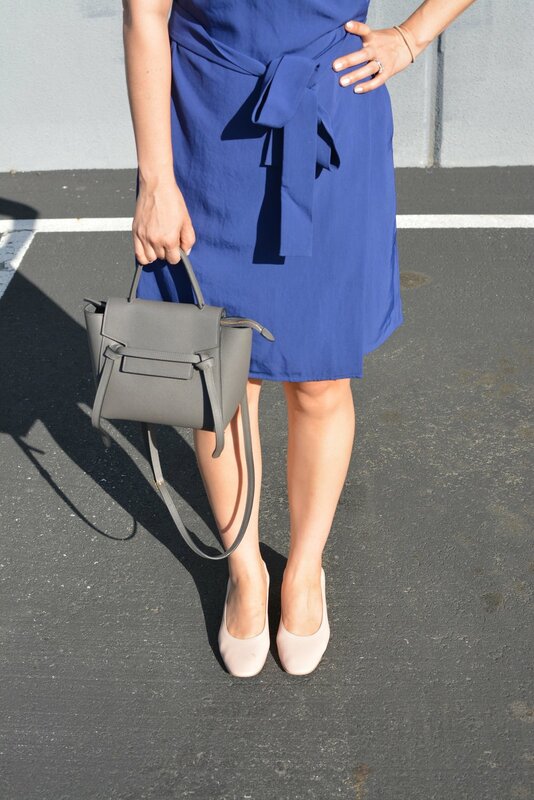 I love the way the bag slouches like a duffle (thanks to the soft Clemence Taurillon leather). I also love that I can carry it by the handles or sling over my shoulder. It’s surprisingly roomy and can fit a lot of things if I need to. This was the bag that made me realize that even though the Loewe hammock bag above had a similar concept, it just wasn’t the same (and whenever possible it’s best to go with what you really want over some kind of substitute). So I should note that I obviously have a favorite type of bag and these kinds of bags make up 4 out of the 5 on my “Best” list: it’s the bag with both top handles and a long shoulder or crossbody strap. I love the convenience of these bags because it makes it easy for me to grab things from my bag by holding on to the handles or I like to sometimes carry it on my arm by the handles, but when I want to go hands-free, I can sling the bag over my shoulder. I have other favorite bags, like my classic Chanel flaps (which I use only when going out or special occasions), my Balenciaga work bag (for when I need to carry a lot of stuff), and my Longchamp nylon bags (for travel). But these bags are not my most used bags, instead they each have their specific use case scenario. So of course take this best and worst list with a grain of salt but in general I can attest to the quality of Celine bags (or at least old Celine bags), and would not recommend the Goyard totes, trendy Gucci bags, or delicate Valentino bags.